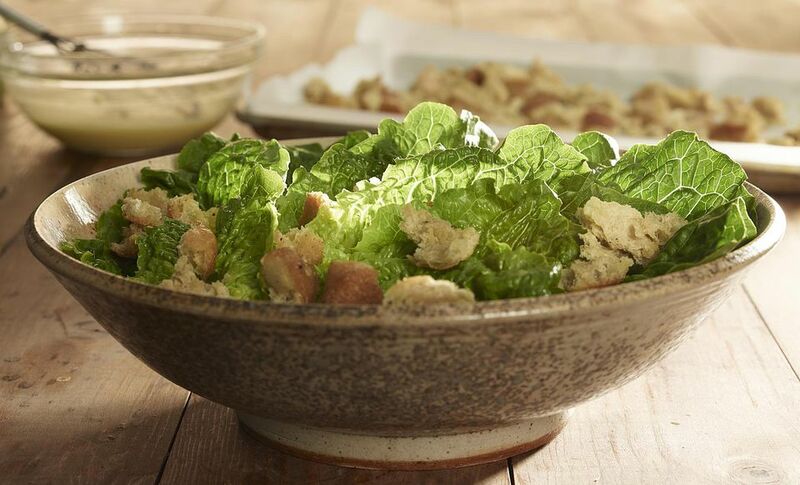 Caesar salad is quite possibly one of the most common and loved salads around. And what's not to love about the Caesar? Crispy romaine lettuce lightly coated in a creamy dressing, topped with soft-cooked eggs, crispy bacon, crunchy croutons, and Parmesan cheese. Sounds delicious, doesn't it? Caesar salad dressing is so easy to make and once you've tried homemade dressing you won't go back to the store-bought kind. Since the egg yolks in the dressing will not be cooked, use pasteurized eggs. Read about Caesar Cardini who developed this salad. Cut the bread into 1/2-inch (1.27-cm) cubes. Heat 2 tablespoons neutral oil in a skillet over medium-low heat. Gently fry the bread for about 4 to 5 minutes, turning occasionally, until crisp and golden. Remove bread with a slotted spoon and drain on paper towels. Set aside. Fry the bacon in the same pan over medium-low heat until crispy. Remove with a slotted spoon and drain on paper towels. Set aside. Meanwhile, boil 3 eggs starting in cold water. Once the water reaches a rolling boil, boil for 3 minutes for soft-boiled and 6 minutes for hard boiled. Remove from water and rinse under cold water until cool enough to handle. Peel and set aside. Place 2 egg yolks, chopped anchovies, mustard, and garlic in a large mixing bowl. Whisk vigorously to combine ingredients. Slowly add the oil a few drops at a time, while continuing to whisk vigorously. The mixture will thicken. Add the vinegar or lemon juice and whisk again. The dressing should have the consistency of whipping cream. If it is too thick, add a teaspoon of warm water and whisk. Roughly but evenly chop the lettuce and place in a large mixing bowl. Add 4 to 5 tablespoons of the dressing and toss well to coat the lettuce. Add the croutons and bacon and toss again. Cut the boiled eggs into quarters. Divide salad into four serving bowls and top with boiled egg quarters. Grate on some Parmesan cheese and serve immediately. Any leftover Caesar dressing should be refrigerated immediately and can be kept for 1 to 2 days.